all mine! : Looking for a greener distribution? Looking for a greener distribution? Join the thundring herd of geekos! Last week we released openSUSE 12.3 and the responses from the community and the press were better than ever before. Lots of journalists announced we've moved firmly in the top spot or top-three of favorite distro's and quite a few are running openSUSE now. Seeing the many blog posts, tweets, facebook posts and Google+ discussions, the community feels very much the same! Now maybe you're not 100% happy with your current distribution. Maybe it isn't entirely stable or you sometimes would like it if things just worked. Or you worry about the decision making process and the future of your current choice. Maybe you don't want to wait for stuff to compile anymore. I know, the technical differences between distributions are not huge. I'd even argue they are small - differences in philosophy and how they are developed are bigger, however. And I can imagine one feels more comfortable with a project which picks collaboration and sharing over secrecy and Not Invented Here. I know what I prefer. Technically, openSUSE belongs to the top distributions as well. And while nothing is perfect we at least make it darn easy to fix stuff without administrative sillyness. So whatever the reason for looking somewhere else - I think it is fair to say that openSUSE should be on your short list of distributions to try. To help with the trying, I called in help from our community and created an openSUSE introduction and a cheat sheet for moving over to openSUSE from a variety of other distributions. Check it out on news.opensuse.org! the software.opensuse.org packages overview is the easiest way to find and install extra or updated software on openSUSE. Get some more software installation tips and read some interesting KDE and GNOME tips & tricks. And of course you can download openSUSE 12.3 on software.opensuse.org and find out what is new in the announcement. For me openSUSE 12.3 is the first rock solid distro in years. 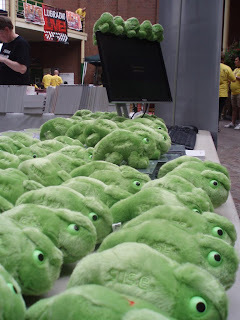 There have been a few good ones, but not as thight an polished as the latest openSUSE. Thanks a lot to everyone making this possible. Thanks, I'm glad you enjoy it! I had it freeze up my laptop 2 minutes after the first reboot once the installation is complete. However for some weird reason every single KDE distribution does this on my laptop. What happens is my laptop completely freezes up and my display looks like one of those 1980 arcade games when switched on. I have to keep the power button pressed in for 5 seconds to completely kill the laptop. It is a Dell Studio 1558 laptop with i5 CPU and ATI 5400 Mobility series GPU. The thing is I can run windows games (wow and d3) for hours and hours with no issue. I dual boot with Ubuntu 12.04 and I use that for downloads and general work where the laptop will at times be switched on for days without a reboot. I'm not any kind of wizard, but maybe my hints will help in some way. First thing, which comes to my mind are borked graphic drivers. According to my experience, ATI is a really bad choice, if you have something to do with Linux, but as I understand you are pretty much stuck with it, so maybe try switching between different drivers (e.g. proprietary from ATI, if it is still available and free one, which in theory should be on by default). Another thing, which may be the culprit is file indexing (e.g. Nepomuk and friends). You really deserve the success. This release is great. On my laptop I replaced Windows 8 with OpenSUSE 12.3 and everything is working fine! The system is beautiful, incredibly fast and it's really a pleasure to use KDE. I've been a Linux user for a long time, but then I got tired of its load of problems and I switched to Windows. Now, after using OpenSUSE, I have to say this: Linux is ready for the desktop... or at least, OpenSUSE is! I really appreciate the effort and the ethic behind OpenSUSE. Nice work and thank you. Thanks, I'm happy to hear you like it! Looking for keepassx from the above got the warning message highlighting that the packages are from "unofficial repositories" and that the packages are not reviewed by openSUSE and may contain unstable or experimental software. Are these repositories maintained, security wise? Else, you should highlight this fact to your readers before recommendning.